https://sep.yimg.com/ay/yhst-33477391359232/brain-coral-favites-species-brain-coral-closed-pinapple-closed-brain-honeycomb-coral-9.jpgBrain Coral - Favites species - Brain Coral Closed Pinapple - Closed Brain - Honeycomb CoralEasyAggressiveYesCalcium, Strontium, Trace elementsIndo-PacifcFaviidaeSmall 2" - 3"
Brain Coral resemble a brain closely. Its ridges and crevices kick you with no name other that the Brain Coral. 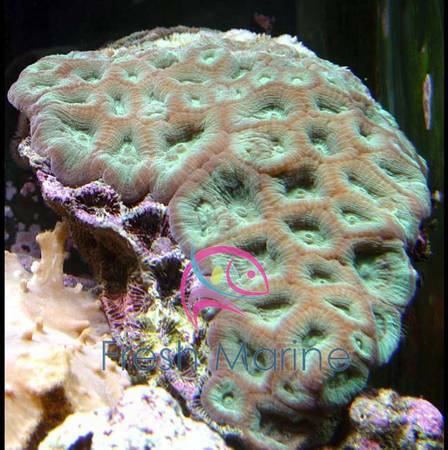 Brain Coral is easy to maintain and is a popular choice amongst the beginner aquarists, intermediate aquarists and expert aquarists. Its easy maintenance evolves due to the fact of it having hardy skeleton. You just need to give it space to spread itself well and the coral will not bother you any more. Also, keep the other corals away from Brain coral else, it may sting them. The article briefs you about the various dimensions of Brain Coral with respect to its maintenance in a reef-type marine aquarium. Other names: The scientific name of Brain Coral is Favites species. Brain Coral is also commonly called as Honeycomb Coral, Pineapple Coral, Moon Coral, Closed Brain Coral, Brain Coral Closed Pineapple, Star Coral and Worm Coral. Coral Type: Brain Coral is a Large Polyp Stony (LPS) Coral. Origin or natural range: The Favites species originates from the Indo-Pacific region. Size: The size of Brain Coral varies being contingent upon the factors such as the depth of water level where it lives, the flow of water around it and the surroundings of the Favites species to name some. Color: Brain Coral occurs in yellow, cream, green, brown, tan and orange colors. Morphology: The Favites species is structured like a brain and has a skeleton of Calcium Carbonate. The skeleton has many ridges on its surface in which the animal lives. Brain Coral has long sweeper tentacles which extend well beyond its base when open. Compatibility: Brain Coral is aggressive towards the other marine aquarium invertebrates. Habit & Habitat: The Favites species is nocturnal in its habit and therefore, extends its tentacles at night. Temperature: The temperature of water in your marine aquarium should range within seventy-two to seventy-eight degrees Fahrenheit. Specific gravity: The specific gravity of your marine aquarium�s water should stand between 1.023 and 1.025. Illumination: Brain Coral requires moderate lighting in the marine aquarium it inhabits. Full spectrum light of 6500K combined with Actinic Blue lighting in your reef tank is recommended for the growth of the Favites species. Water flow in the aquarium: Brain Coral needs indirect, intermittent, moderate water current in the reef tank hosting it. Marine aquarium habit & habitat: You can place Brain Coral anywhere in your marine aquarium. Keep the Favites species away from the other corals in your marine aquarium as its sweeper tentacles may sting the other corals. Being nocturnal in habit, Brain Coral extends its tentacles at night, well beyond its base. Feeding & Nutrition: Brain Coral is Carnivorous in its feeding habits and filter feeds at least twice per week in the evening. The food of Brain Coral may consist of acellular marine invertebrates, Mysis Shrimp, meaty bits, zooplankton and phytoplankton. Add Calcium, Strontium and trace elements to the aquarium water as dietary supplements for Brain Coral. Care: Brain Coral requires moderate care. Caution: Give ample space to the Favites species to extend its sweeper tentacles fully in your marine aquarium. Keep the Brain Coral away from the other corals in your tank as its sweeper tentacles may sting the corals if obstructed by them.